Konjac has been used for weight loss for thousands of years in Japan. Nutritionist Pierre Dukan popularised the root of the fibrous plant in 2011 when he added it to his 100 approved foods list. Discover the wonderful possibilities of konjac in a variety of products, available at a store near you – or at the click of a mouse! Try our NEW BOLOGNESE KONJAC BOX now! Konjac shirataki noodles, Mediterranean vegetable konjac noodles and Italian konjac noodles. Dukan dieters can eat unlimited amounts of konjac throughout all the phases of the diet. It is most commonly found in a noodle form (shirataki). Konjac is an excellent filler, contains next to no calories, is an important component of a no-frustration weight loss programme. Konjac is a 100% natural, gluten-free food that is non-allergenic. It is virtually free of calories and absorbs up to 100 times its weight in water (70 times more than oat bran). Konjac is a weight loss ally: prepared as a noodle dish, you can enjoy a full meal with few calories and feel satisfied quickly. Suitable for diabetics It regulates diabetes by controlling blood sugar levels and plays a role in supporting insulin resistance. Lowers overall cholesterol It promotes HDL (good) cholesterol and lowers triglyceride levels. Effective against digestive troubles and constipation 70% of konjac is made up of non-irritating fibres, which helps transit and cleanses the digestive system. This calorie-free root food is ideal for women and men who are watching their weight. Konjac can be easily added to Dukan diet cooking for extra variety. It is sold in the form of shirataki, spaghetti-shaped noodles, fettuccini noodles, cubes, gelatine blocks (called konnyaku), etc. It is an excellent anti-gloom ingredient. Its bland taste is a blank sheet for your imagination and creativity: prepare it in a sauce, with herbs and spices – however you like! If you're short on time, konjac is also sold as a ready-made nutritional supplement. Konjac is the new slimming staple after oat bran. It adds real value to the Dukan Diet. In pasta form, it offers a calorie-free food option with recognised nutritional properties. In the attack phase, konjac can be eaten in unlimited quantities. It effectively provides a feeling of fullness, as do other foods on the Dukan filling foods list: oat bran, hard-boiled eggs, shrimp, fat-free fromage blanc, turkey, crabmeat, plain tuna, sardines, chunky vegetable soup and poultry liver. Drain konjac noodles, rinse in cold water for one minute. Cook for 3 minutes in a pot of boiling water. Drain. Rinse basil and parsley, remove stems, keep leaves only. Peel garlic and onion. Chop into large chunks. With an electric mixer, blend the parsley, basil, garlic, onion, walnut and olive aroma into a thick “Dukan pesto” sauce. Season with salt and pepper. Dice cheese and put into a microwave-safe container. Add the Dukan pesto sauce, cover and cook in 700 w microwave for 3 minutes. Adjust time if necessary. Heat a non-stick frying pan. Add shrimp with curry cook on both sides until shrimp is pink. Stir the Dukan pesto sauce and shrimp into the konjac shirataki noodles. Serve hot on two plates. 1. 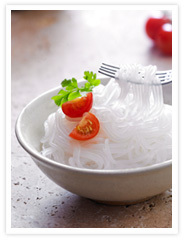 What country to konjac shirataki noodles come from? 2. Who brought konjac to France and made it popular thanks to its role in weight loss? 3. How many calories does one kilo of konjac contain?